Disasters can strike at any time and two things that can mean the difference between life and death is preparedness and having the right training. One key point in disaster management is the quick and the proper administration of first aid to minimize casualties on the side of victims and first responders. No one can predict when a disaster will happen or what will ensue afterwards, but there are some key general rules to keep in mind. During first aid training, the first step that responders are taught to do in the event of a disaster is to assess the immediate vicinity. If the area appears to be unstable or unsafe, evacuation procedures should be started. One tragedy that disaster management heads want to minimize is initial survivors becoming casualties of the unsafe surroundings caused by the disaster. This advice goes for first responders as well, a fact that was brought to harsh reality when dozens of firefighters responding to the 9-11 World Trade calamity also perished when they rushed in to provide assistance. Families and individuals should always be prepared in the event of a disaster. This means each one of us should have a contingency plan in place on what to do and how to react during disasters. For example, families should already have an agreement on where to go or who to contact in the event that one gets lost or separated. Each household should also have an emergency kit with food and other necessities already prepared. Some might think that even considering setting up a command centre while a disaster is on-going is a waste of resources. But that’s actually far from the truth. Establishing a command centre is necessary in order to manage a disaster more effectively. Disasters by nature create chaos so command centres with experience, highly trained professionals are crucial in establishing order and minimizing confusion. Disaster management professionals are trained to come up with an effective action plan for dealing with the aftermath of a calamity. Once a disaster has died down enough, the next step for disaster managers and first responders is to assess and treat victims. First responders have taken numerous first aid and CPR courses and are adept in scanning the area for victims and discerning which should be given priority levels. 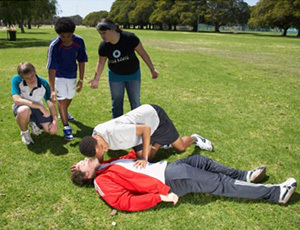 First responders are trained in detecting who can no longer be treated and those who need immediate first aid. Victims who’re unconscious but have a pulse or still breathing are given top priority, followed by those who’re conscious but with severe injuries. Having a clear hierarchy in administering first aid treatment ensures that there’s an organized way of going through victims and helping those who need it most first. One important thing that everyone, from ordinary citizens, to the EMTS, emergency personnel and disaster management heads, should have is the right mindset. While this might not seem important to some, remaining calm and helping each other during a dire situation can help save a lot of lives. Remember that it’s best to follow the instructions of responders and disaster management personnel during emergencies. These people have first aid certification and are highly trained in coping with emergency situations. But more importantly, people should maintain a positive outlook, for even if a situation seems bleak, there’s always hope.